Today has been a fail, I was meant to be going into town with my boyfriend to pick up a laptop case/browse the shops! However as soon I was dressed and ready it started snowing and now everything has a layer of snow on it! We did manage to make it down the road to get some food for this evening from the Co-op! The first lot of photos are from yesterday when my house mate Imoan (Naomi backwards) and I went on our weekly shopping trip to town, always vowing we won't spend money, however we always do! I wanted to road test my new sunnies which I LOVE! I was a bit concerned that they don't suit my face shape, but I like them which is all that matters I guess! 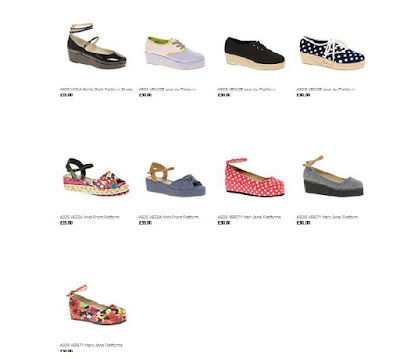 I was browsing asos.co.uk yesterday and I am loving their Flatforms! I think they are perfect for the summer. Click here to check them out! I love the polka dot and flowery ones! !